Buckets, Pails, and Firkins; What’s the Difference? | Skinner Inc. 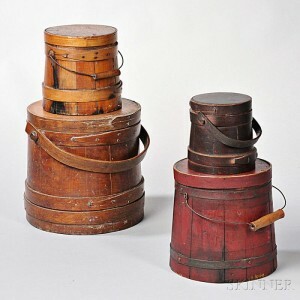 Whether painted or undecorated; staved or tinned, with or without lids; utilitarian buckets, pails, and firkins have for over a century, been popular with collectors. Like so many things with the passage of time, the terminology that is used to describe these humble objects has become muddled. I have always been a firm believer that when describing historical objects, we should describe them today as they were described during their original period of use. Let’s take a look at the historical meaning of these words. The primary meaning of the word pail as defined by the OED is “An open-topped vessel with a hooped carrying handle, typically of slightly tapering cylindrical shape, used esp. for holding or carrying liquids; (now more generally) a bucket.” Various dictionaries from the 17th through the 19th century also support the notion of a pail as a vessel for carrying liquids often specifically mentioning water and milk as the liquids specifically carried by pails. A Firkin, unlike a bucket or a pail, has its roots as a specific quantifiable English measure. A firkin, generally, is a liquid measure consisting of a quarter of a barrel or eight gallons. From the 16th century commodities such as ale and beer were commonly marketed using this measure. A firkin of ale measured eight gallons while a firkin of beer measured nine gallons. In the case of ale and beer, the firkin container was simply a smaller version of the common barrel. Other materials were also quantified by firkins. Butter, fish, and soap were also commonly sold by the firkin. 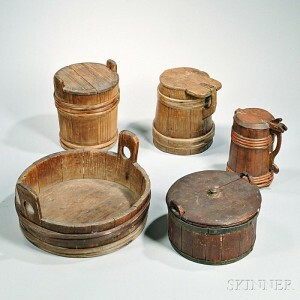 A firkin of butter, for example, was by law required to weigh fifty-six pounds and numerous laws are recorded in England and America regarding the production and marking of firkins to identify who made them and the container’s capacity. Very few containers broadly referred to today as firkins have any such marks. However you describe them, buckets, pails, and firkins are important survivors of everyday life. Like so many things that began life with a single purpose, the functions of these items have become blurred with the passage of time. 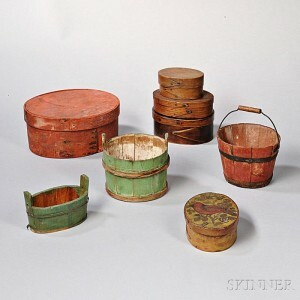 To view pails, buckets or firkins in our Americana Online auction visit www.skinnerinc.com/auctions/2824T/lots. This entry was posted in Blog and tagged American Furniture & Decorative Arts, Americana, bucket, buckets, containers, firkin, firkins, historical objects, online auction, pail, pails, skinner, Skinner auction, terminology, unit of measure by Christopher D. Fox. Bookmark the permalink. What purpose was the partition in the Firkins bucket? When were leather gaskets first used with rope bales on wooden buckets with stopper knots? The little wooden pail/firkin I have is made of one piece of wood and looks like a small tree trunk section, hollowed out, split into three pieces and a groove made so that a beveled oak disk could be inserted to create a water tight bottom to the bucket. The base, middle and rim is bound with thin iron bands, each end overlapped slightly and secured with an iron rivet type piece. The iron handle loops are attached to what was a continuous thin iron band. The band was hammered into a loop at each end to accept the handle loops. This vertical band is beneath the horizontal bands and before it rusted out, ran across the bucket bottom and up the opposite side. The entire lip of the bucket is rounded, black and smooth from wear. The hammered iron handle is attached in a way that makes me think there was never a lid. There is no evidence there was a lid. It holds about 3.5 cups of water. I’ve wondered if it may have been kept by a spring hole to dip and drink water? Seems like use for dry goods or butter may have shown different wear. I appreciate anyone’s time who may have more info about this kind of vessel. Thank you!